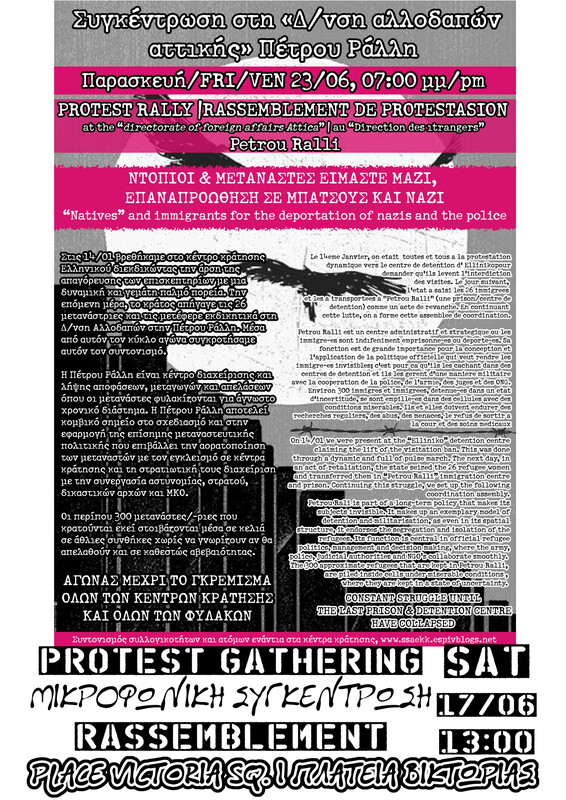 Call for protests at the Petrou Ralli detention center in Athens on June 17 and June 23. On 14/01 we were present at the “Elliniko” detention centre claiming the lift of the visitation ban. This was done through a dynamic and full of pulse march. The next day, in an act of retaliation, the state seized the 26 refugee women and transferred them in “Petrou Ralli” immigration centre and prison. Continuing this struggle, we set up the following coordination assembly. Petrou Ralli is part of a long-term policy that makes its subjects invisible. It makes up an exemplary model of detention and militarisation, as even in its spatial structure, it endorses the segregation and isolation of the refugees. Its function is central in official refugee politics, management and decision making, wehere the army, police, judicial authorities and NGOs collaborate smoothly. The 300 approximate refugees that are kept in Petrou Ralli are piled inside cells under miserable conditions, where they are kept in a state of uncertainty. Previous post: Hands off from #CityPlaza and all other Refugee Squats!